Modeling his Baucher last summer...minutes before he got his tongue over the bit for the first and only time in his life. In Dressage. Wheels Himself ended up leapfrogging the field from second to last after Dressage to second in our division because we were one of two pairs to have no time penalties on XC. In Starter. I still find this hilarious. I have never been so wrong in my life! Of course, it could have been the dump truck right next to us dropping a ton of sand down the length of the track that runs alongside the outdoor (the only thing that bothered him was the air brakes), or the fact that we were in the outdoor for the first time since November, or the fact that it was 65 degrees for the first time since probably even earlier, but even when I had his attention his mouth never softened and he never mouthed the bit. Back to the loose ring, and our very next ride was not quite on my aids, but with a soft mouth. And our next lesson was on the aids and awesome. (We're in that phase of learning something new where my rides on my own lag 2-3 weeks behind my lesson rides. It'll come.) So, lesson learned: right now, he needs me to ride well more than he needs a bit change. 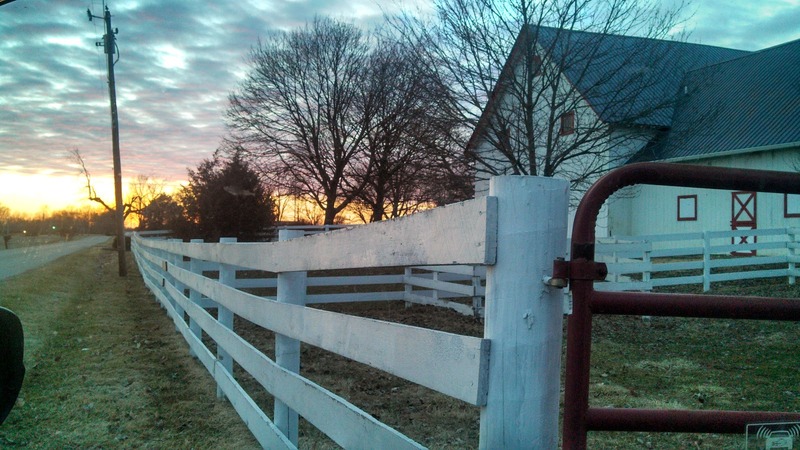 Sign of spring in Indiana: still light out at 7:45pm. 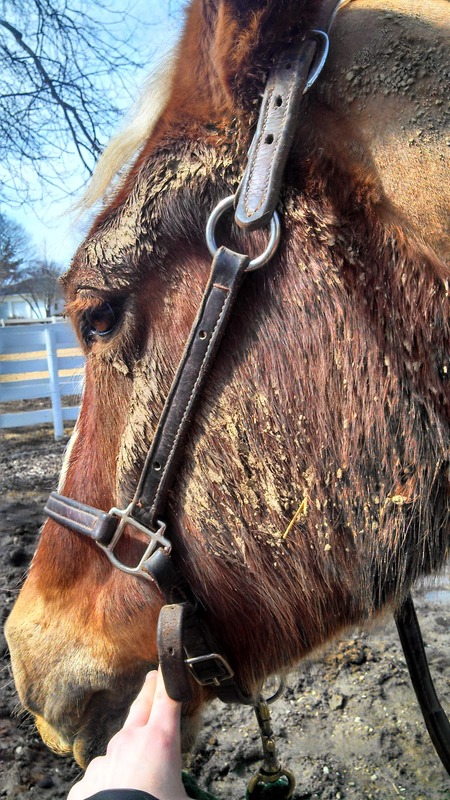 Sign of spring in Indiana: muddy pony. Mud... I hate it so much! Good thoughts. Sometimes I get caught In a "bit will fix" mindset and then I think again and realize that sometimes I bit change can help but it's not a solve all. Me too, I am considering putting him in a head to toe sheet until summer. :) Yeah, I tend not to switch too often, he's been in the loose ring, then the full cheek, then the baucher, and now the loose ring. You're right, they can help, but I still eventually want him in the loose ring permanently - maybe we are there and I just haven't realized it. I love the loose ring French link snaffle. It has always been my go to bit. I had a similar revelation one time, when I realized that I was not touching the inside rein at all and maybe it was time to let myself use my inside hand. It is just so easy to go too far with it. It's funny that you say that, because in my lesson on Thursday I told my trainer that I was uncomfortable with how hard I had to ask to get the bend she wanted - and when I got it, he really felt great. She said it's fine to have to ask with more force at first as long as I immediately release with an equal amount of give, and that the amount of force required will continue to get smaller as he is more able to sustain that degree of bend without the constant reminders. Agreed! Isn't it funny how that works? I think that's why I'm so afraid to touch the inside rein, I used to do the same thing. That pastel sunset, swooon. I have never used a french link. They're worth trying, I think. I hadn't either until I came here, where pretty much every horse goes in a French link. It lays nicely across the tongue, and Connor mouths the bit a lot more in one over a single jointed bit. Bits are tough. Paddy listens (mostly) in the Myler baucher, but the loose-ring french link is a recipe for a train wreck. Single-jointed bits are also a no-go. 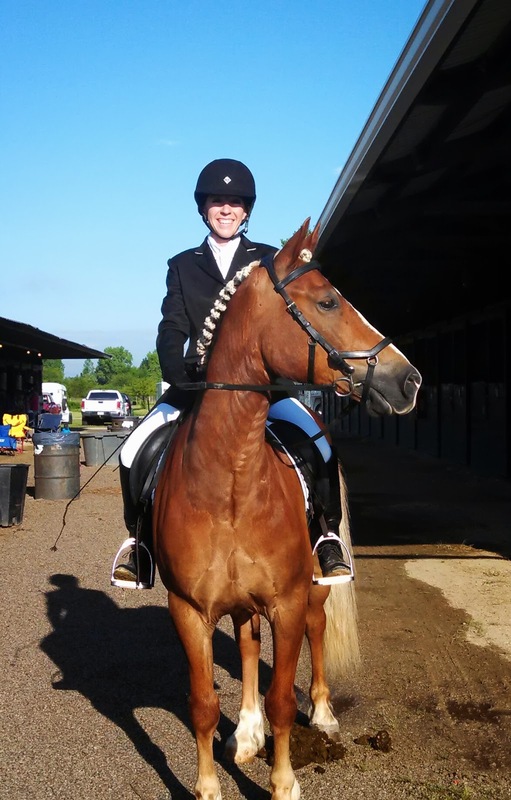 Every horse is really different, and at different times in their training! Agreed. We went to the full cheek snaffle because he wouldn't bend, and then to the baucher for a bit more leverage, but we learned so quickly during the baucher period. Then I switched to back to the loose ring and it was magic. It just depends on where they are, I think. Mylers are cool, I rode in one in college. I play with Courage's bit some, but that's more because I like bits than because I think it makes a huge difference to us right now. I was just going to do a post of this, actually. I hate when you switch and it turns out to be a big fat NO. I always go back and switch it again...such a waste of time! Glad you are back in something that works.